Green Tea Elite w/EGCG / 60 Veg Caps - Nature's Way®. This standardized supplement contains 57% polyphenols, compared to 8% to 12% in dried green tea leaf. It's also standardized for a minimum of 39% epigallocatechin-3-0-gallate, one of the most beneficial, “power hitters” of the polyphenols. Plus, unlike green tea drinks, this supplement is caffeine-free. 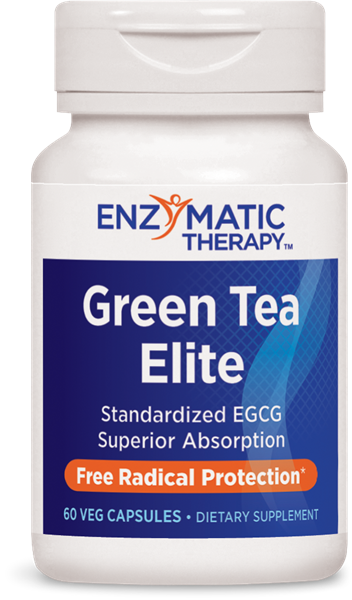 How much EGCG is in each serving of Green Tea Elite? The green tea extract found in Green Tea Elite is standardized to contain a minimum of 40% of beneficial epigallocatechin-3-0-gallate (EGCG). Each capsule provides more than 13 mg of EGCG. How much caffeine is in each serving of Green Tea Elite? Green Tea Elite is caffeine-free.